During a recent family trip to Paris, my son Lachlan and I squeezed in a day-trip to the Canadian National Vimy Memorial, a memorial site in northern France dedicated to the Canadian soldiers killed in action during the Battle of Vimy Ridge, and World War I in general. Lachlan is a war history buff and an ardent patriot (more so since we tore him from the bosom of his beloved Canada), so he was keen to visit the site, which is about 90 minutes north of Paris by TGV train. I was eager to join Lachlan on this day-trip so that we could spend time together traveling to and reflecting upon this poignant and significant memorial for Canadians. 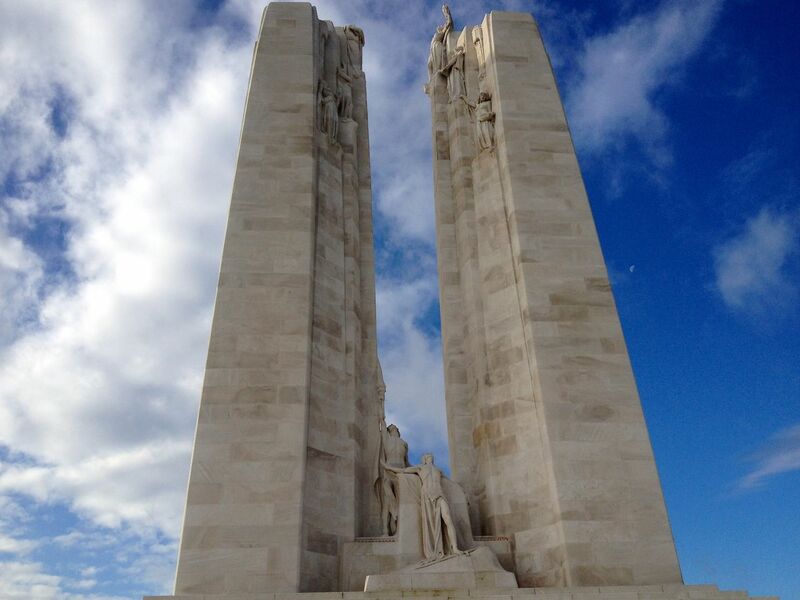 Canadian National Memorial at Vimy Ridge. Before describing our visit, here’s a brief refresher on the Battle of Vimy Ridge (in case, like me, you were asleep during high school history class). Vimy Ridge is a long escarpment that rises a couple of hundred feet out of the Douai Plains of northern France, about 8 km northeast of the town of Arras. The top of the ridge affords an unobstructed view of the surrounding plains, and the German army held the high ground for much of the war, after seizing the ridge in 1914. In early April of 1917, British forces, along with allied troops from Canada, Newfoundland, Australia and New Zealand, launched the Battle of Arras, which was designed as a diversionary tactic to draw German forces away from positions further south, which were to be subsequently attacked in a massive assault by French forces known as the Nivelle Offensive. The offensive was designed to smash through the German positions, break the trench warfare deadlock and engage German forces in mobile warfare. 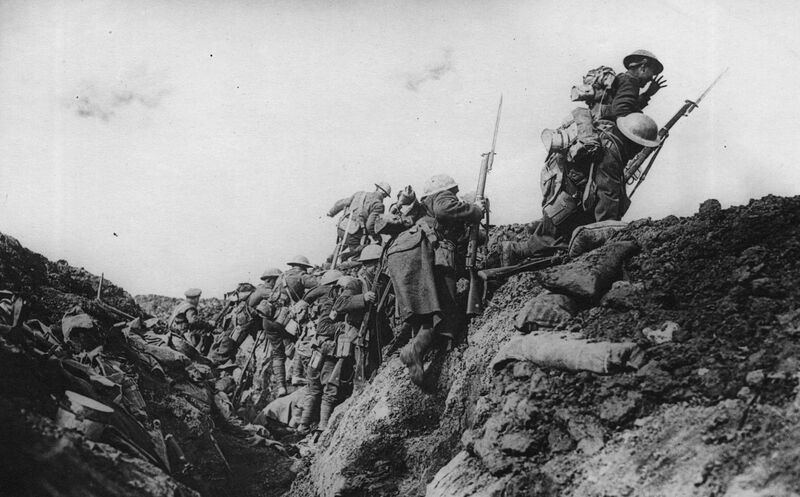 A Canadian contingent of 4 divisions (almost 100,000 soldiers), fighting together for the first time in the war, were assigned the grim task of capturing Vimy Ridge. Previous Allied attempts to regain the ridge from its German occupiers had ended in failure, with French forces alone suffering 150,000 casualties at Vimy and the surrounding area. For 2 years prior to the Canadian assault, Allied and German forces had reached a stalemate at Vimy, facing one another from trenches separated by stretches of no-man’s-land barely 50m across in some places. 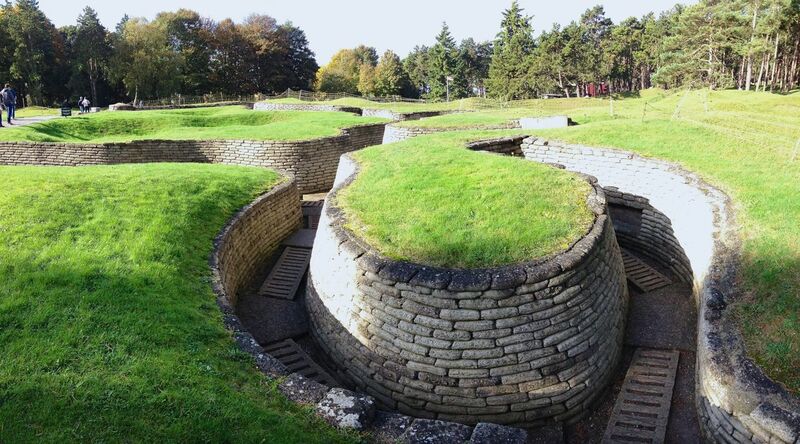 For a year or so prior to the arrival of the Canadians, British forces installed at Vimy had engaged in a protracted conflict with the Germans involving extensive use of tunneling, with each side quietly trying to dig beneath the opposing side’s trenches before detonating massive caches of explosives, leaving the terrain dotted with massive craters, not to mention bodies. 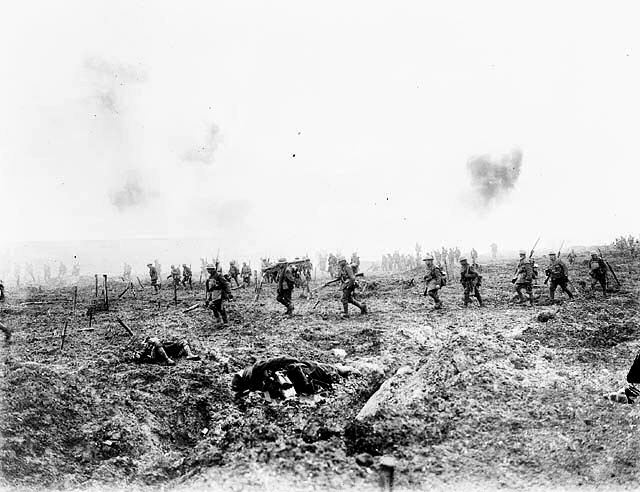 Canadian forces moving across the devastated landscape of Vimy Ridge. After months of careful planning and training, the Canadian assault on Vimy Ridge began at dawn on April 9, 1917. After spending the night waiting silently in the tunnels under Vimy, tens of thousands of Canadians poured onto the battlefield at once. Including support from the British, almost 200,000 soldiers were involved in the operation. The Canadians advanced quickly on the German positions behind a massive, creeping barrage of artillery and managed to capture most of the ridge by the end of the first day, after the German forces vacated due to lack of ammunition. By the 12th of April the Germans were in full retreat from the area. The Canadian victory came at great cost, mind you, with 3,598 Canadians killed and 7004 injured, and an unknown number of German casualties as well. 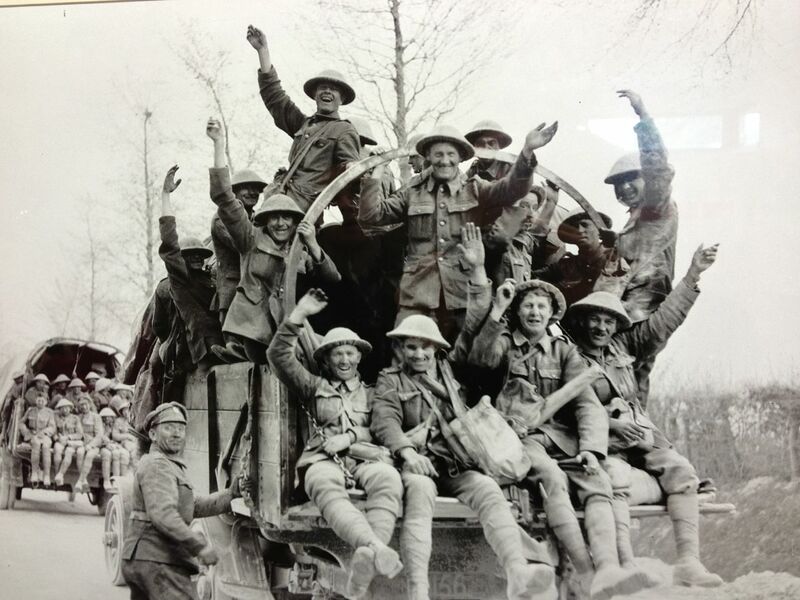 Celebrating victory after the Battle of Vimy Ridge. 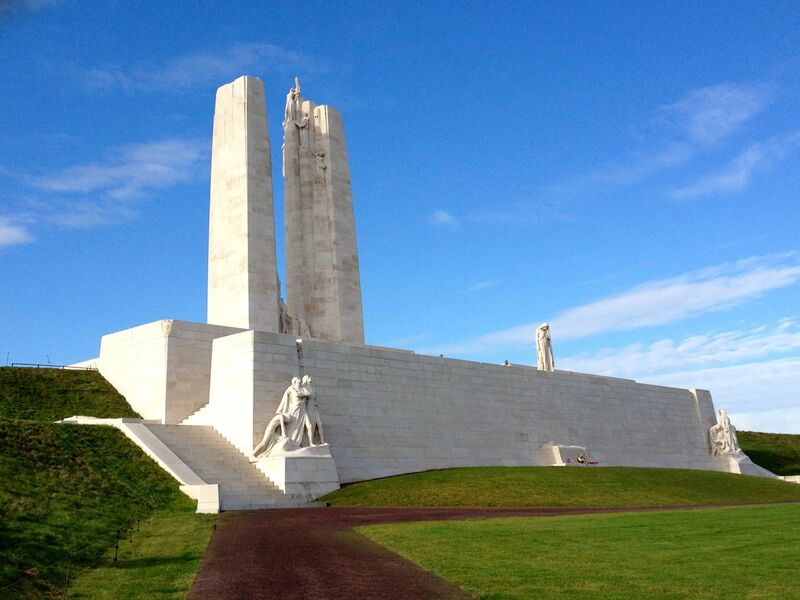 Interestingly enough, while the Canadian forces were lauded for their accomplishment at the time – and every Canadian learns about the battle in school – the Battle of Vimy Ridge was of little significance to the big picture of WWI. The broader French operation of which it was a part, the Nivelle Offensive, failed to achieve its objective of smashing through German lines. And while the German officer responsible for holding Vimy was relieved of his command, the battle was considered little more than a minor setback at the time. The historical significance of the victory seems to lie in solidifying Canada’s military and national identity as distinct from its British colonial masters. Ok, end of history lesson. Now for our actual visit. Vimy Ridge and the memorial lie 8km outside the town of Arras. Arriving in Arras by train, we had to take a taxi from the train station, which cost about 20Euros. There is no public transportation to the memorial site. The first thing one notices on the drive to Vimy Ridge is that the whole area is dotted with military cemeteries. An astonishing 200,000 war graves can be found within a 10km radius of the ridge, proof of the savagery of the WWI conflict. We came across three enormous cemeteries on our drive and I asked our driver to stop so that we could visit two. La Targette cemetery. British graves in the foreground, French behind. 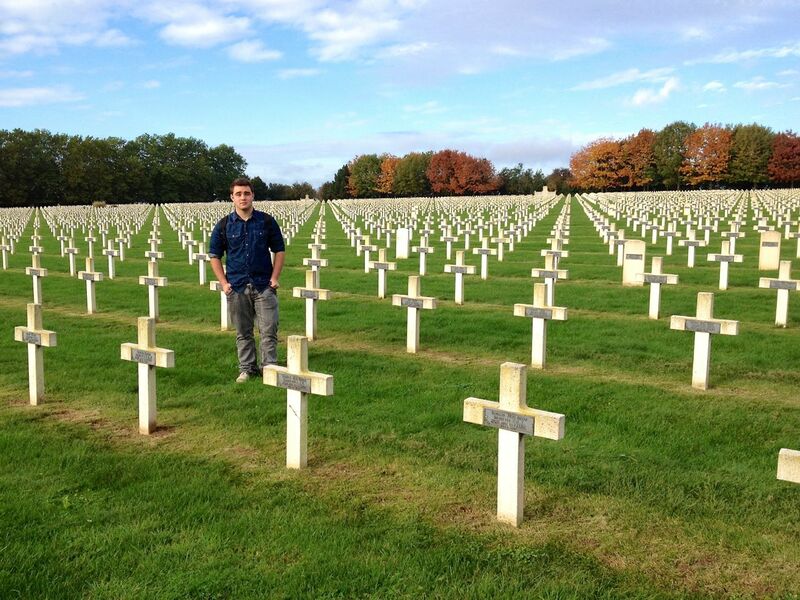 The scale of the French side of the site is mind-boggling, as thousands of crisp white crosses, laid out in tidy, perfectly spaced rows, stretch seemingly to the horizon. The site certainly calls to mind the poem, “In Flanders Fields,” authored by a Canadian, Lt Col John McCrae, during the war. Further along the road we passed the Cabaret-Rouge cemetery, which contains the graves of another 7,650 soldiers from Britain and other Commonwealth countries. 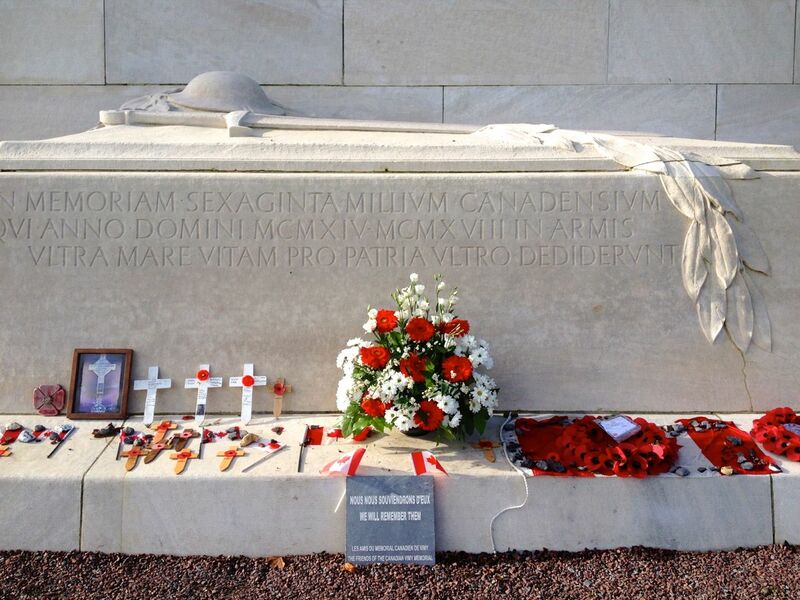 Many of the Canadian dead from the Battle of Vimy Ridge are buried here. Just before the village of Neuville-St Vaast we also stopped at an enormous German WWI cemetery, the largest in France, where 44,830 German soldiers who died fighting in the area are buried. Thousands of steel grey crosses mark the graves of four soldiers each, with names and rank engraved upon them. Scattered among the crosses, here and there, are a few more traditional headstones bearing, ironically, the Star of David, marking the graves of Jewish soldiers. 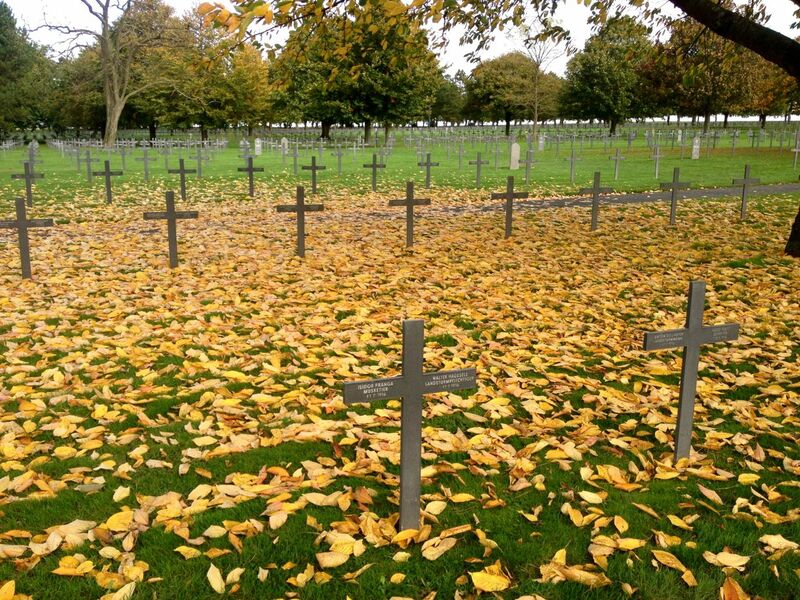 German WWI cemetery outside Neuville-St Vaast, final resting place for 44,830 dead. 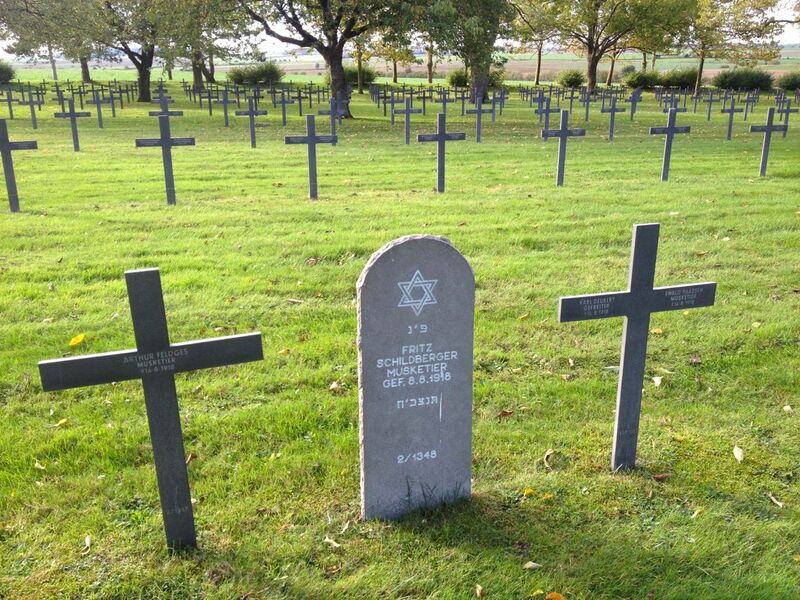 German Jewish soldiers from WWI were buried alongside their fallen German comrades. The terrible beauty of such places provokes mixed emotions. 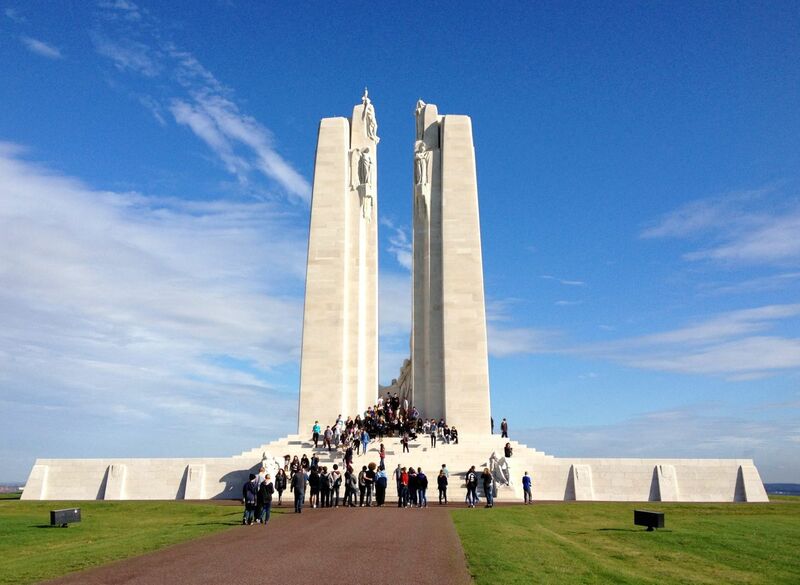 From here we carried on to Vimy Ridge itself, home to the Canadian WWI memorial. 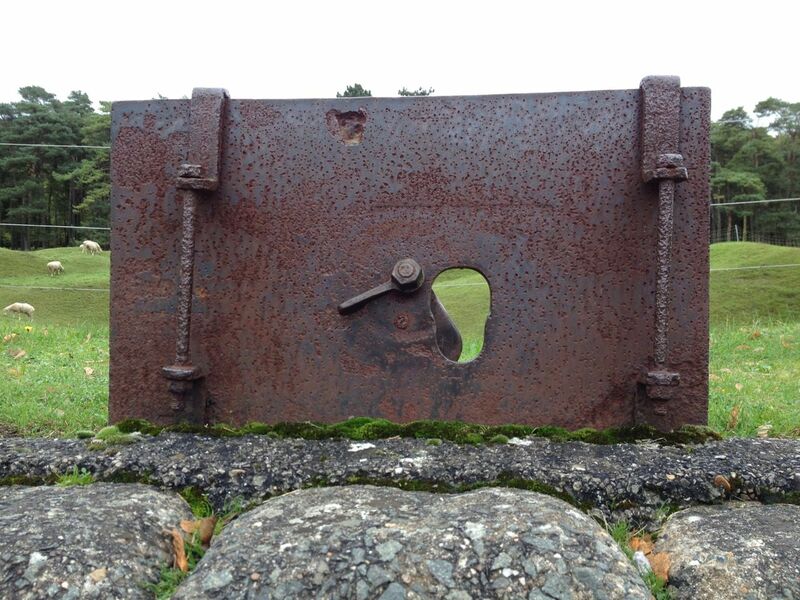 The memorial site is contained within a 250 acre plot of land given to Canada by the government of France for as long as Canada is willing to use and maintain it as a site for war remembrance. The focal point of the site is the massive WWI monument itself, which sits on the highest point of the ridge with a commanding view of the surrounding countryside. As luck would have it, Lachlan and I were practically the only visitors that morning and we were able to enjoy the monument and the spectacular view more or less to ourselves. 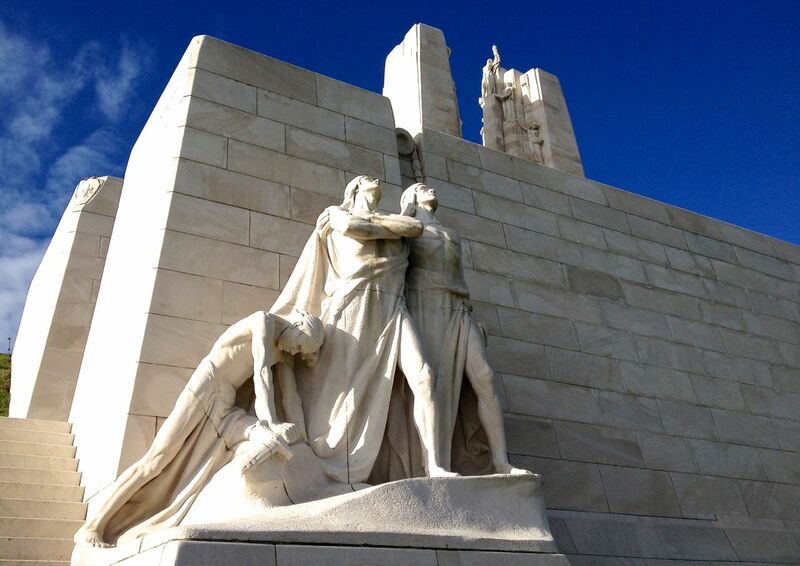 The front of the Vimy memorial, which faces out over the Douai plains. 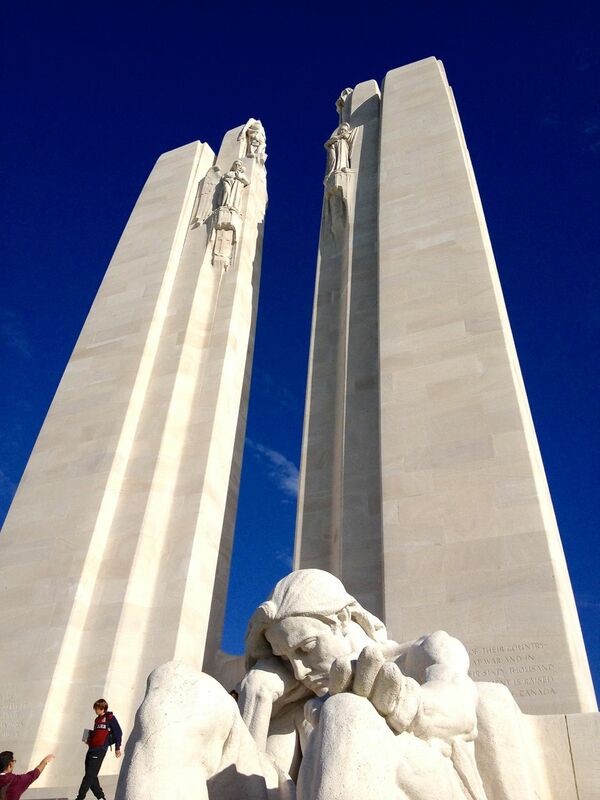 The monument’s twin 90ft towers, representing the friendship between Canada and France. The monument, designed by Walter Seymour Allward and completed in 1936, consists of a broad base and twin 90ft high towers carved out of luminous, white Croatian limestone. The twin towers represent the partnership between Canada and France. 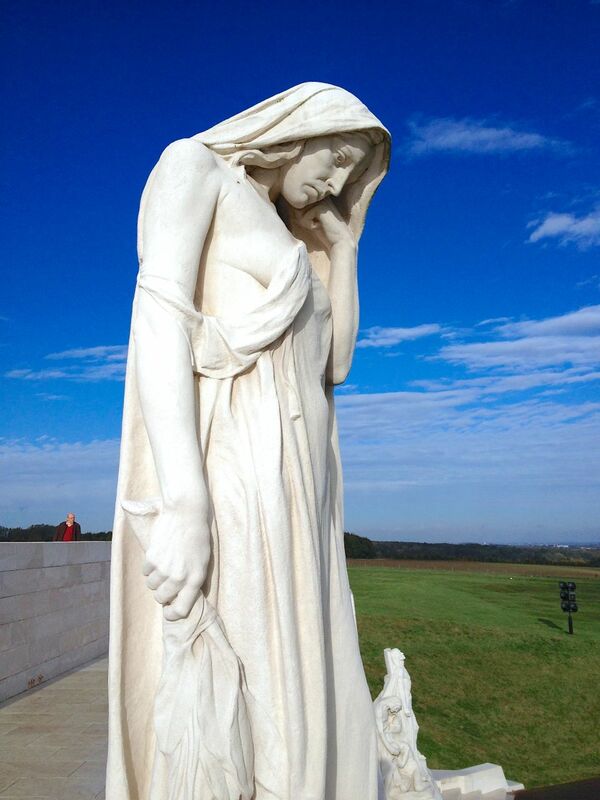 Twenty carved human figures adorn the monument, evoking themes of peace, mourning, care, and sacrifice. The figures that make up The Breaking of the Swords, for example, show three young men breaking a sword, intended to symbolize the defeat of militarism. The original design for the figures had one of them crushing a German helmet under his foot, but this element was excluded from the final design as too triumphalist. The Breaking of the Sword. Other figures include Canada Bereft and Mourning Parents, whose drooped heads and downcast eyes symbolize Canadians mourning the loss of their dead. Finally, inscribed on the walls making up the base of the monument are the names of the 11,285 Canadians WWI soldiers who went missing and were presumed dead. Twin towers soar above the figure of the Mourning Father. 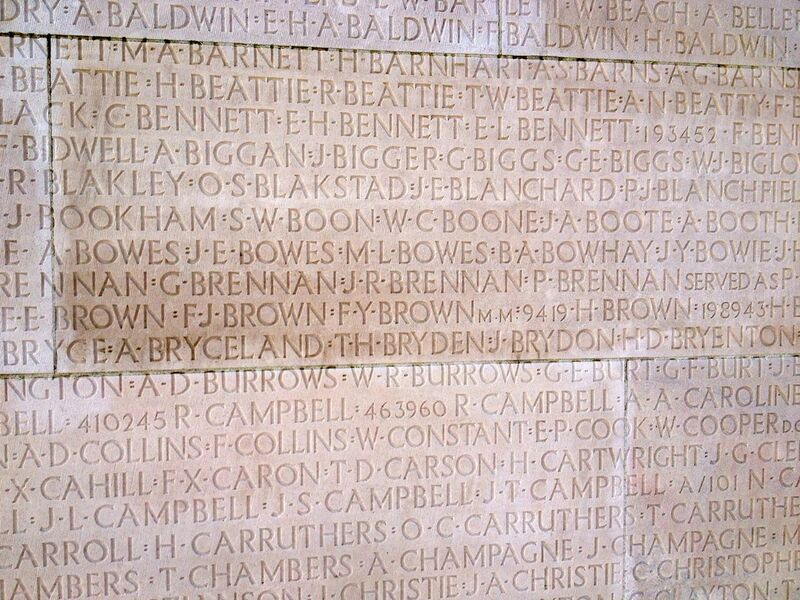 The names of over 11,000 Canadians who went missing in battle and were presumed dead are carved into the base of the monument. Allward’s monument is regarded by many as one of the most beautiful war monuments in the world. Among its early admirers was Adolph Hitler (not sure that’s a recommendation), who toured the monument himself in June 1940, both to pay his respects to Allward’s artistry and to dispel Allied rumours that the Nazis had destroyed it. Today sees thousands of visitors to the site each year, including veterans and their families, active servicemen and women, students, and tourists from around the world. Many leave small mementos and messages of peace at the feet of the carved figures and at the sarcophagus at the base of the monument. 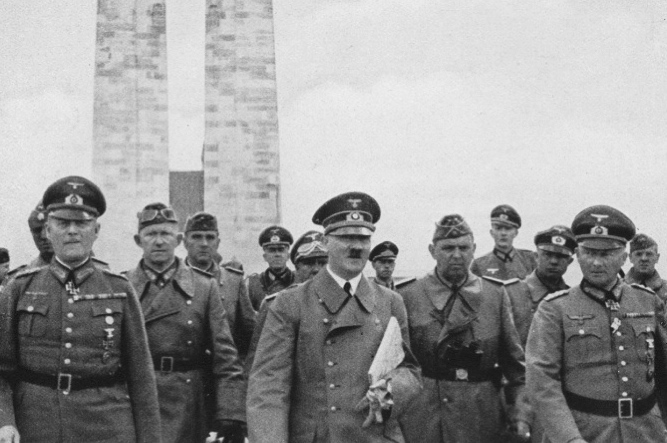 Hitler visited the Vimy memorial in June 1940. Mementos and messages left at the sarcophagus. Weather and the passing of the years have not been as kind, however, and by the beginning of the new millennium the monument was in a sad state, with crumbling foundations and stained and discoloured stone, due to water damage. A two year project of restoration was undertaken and the monument was unveiled once again in 2007. The Vimy memorial, restored to its former glory in 2007. Before leaving the monument Lachlan fished a large Canadian flag from his backpack and unfurled it while standing on the steps leading up to the two towers. It was a proud moment for him, and made for a great photo op for me! 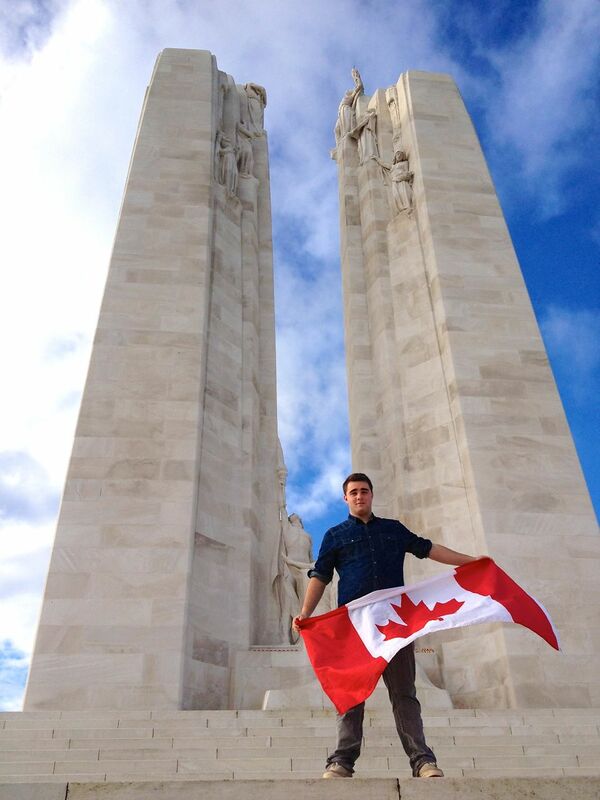 Lachlan honouring Canada’s war dead at Vimy. 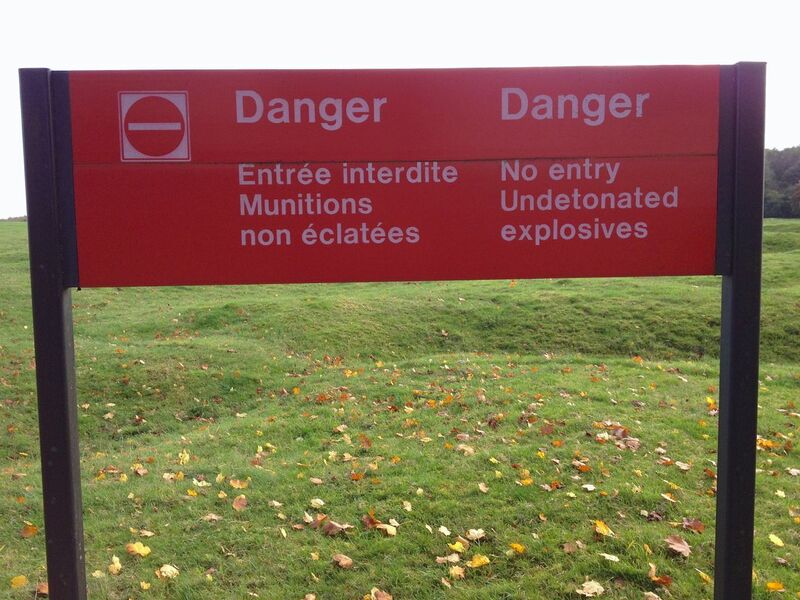 In addition to the monument, the Vimy memorial site includes open and partially wooded areas of preserved battlefield scattered with craters, evidence of the shelling and underground mine warfare that took place here. While the green grass makes it tempting to explore the mounds and craters left behind, the ubiquitous warning signs, not to mention unexploded ordinance, counsel against it. The only ones to walk the battlefield are some local sheep, and staff liked to make jokes about having the occasional free BBQ. Remnant features of the WWI battlefield at Vimy. Stay on the marked paths! Also on the grounds of the site is a network of preserved Allied and German trenches, as well the tunnels used by the Canadians to launch their attack. After leaving the monument we headed to the somewhat make-shift interpretive centre (maintained and staffed by Veterans Affairs Canada) to book a tour. Our tour guide for the afternoon was a young and outgoing female university student who, as part of a Veterans Affairs program, was taking a four month break from school to work at the Vimy site as a guide. She and a dozen or so other students share two houses located in the town of Arras and get to spend 4 months living and working in France! Sounds like a pretty sweet deal to me. Our guide walked us through the trenches while explaining some of the intricacies of trench design, such as the use of twists and turns to absorb shrapnel from mortar strikes, and to provide cover should the enemy invade one’s trench. We toured both Allied as well as German trenches and it was amazing how close they came to one another, sometimes separated by no more than 50m. 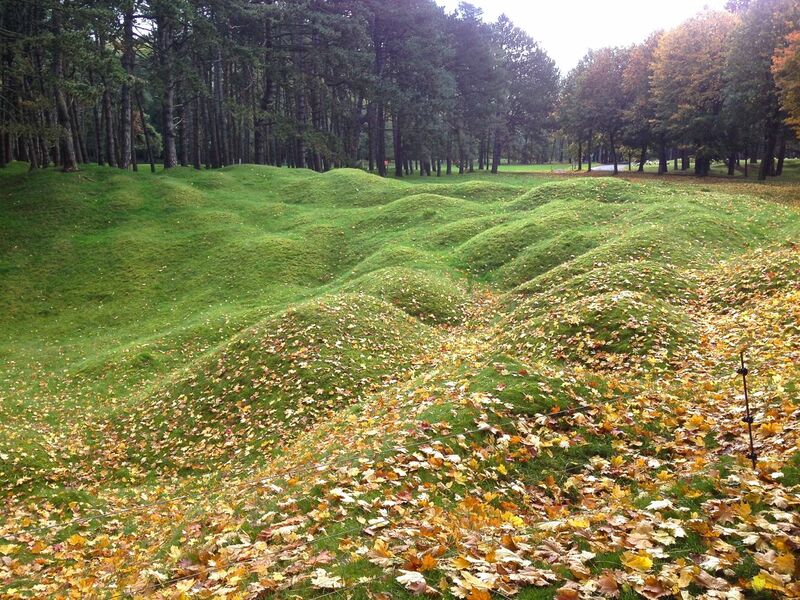 The network of trenches at Vimy is one of the few remaining sites of what was once a vast network of trenches stretching for hundreds of kilometres and that made up the Western Front. 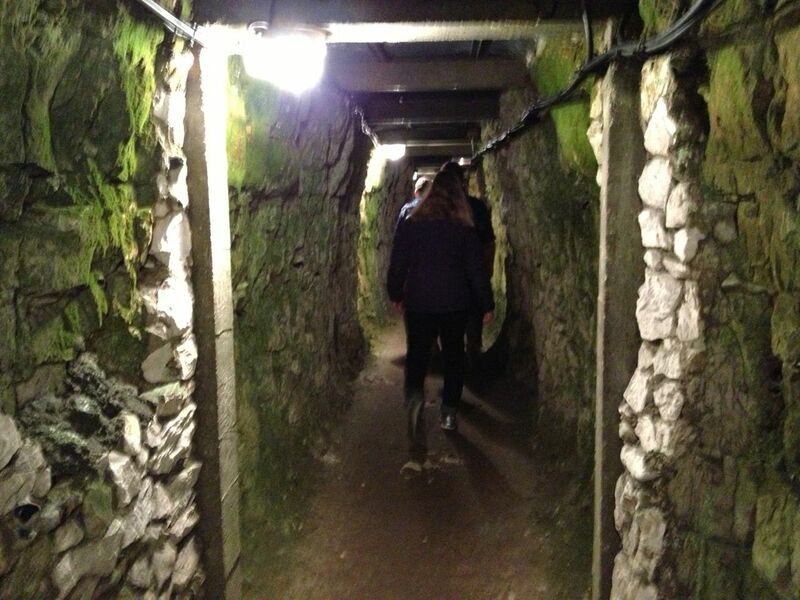 Then we went underground to walk through some of the tunnels. The tunnel network under Vimy was vital to the Allies’ success in retaking the ridge. The British and Canadians spent months quietly digging new tunnels in the soft chalk rock to be used to funnel soldiers to the front, take back the wounded, and to channel messages and supplies to where they were needed. Some of the larger tunnels were laid with rails so that men and materials could be transported by small-gauge trains. It was in these tunnels, as well, that thousands of Canadian soldiers waited silently through the night of April 8th – so as not to tip off the Germans and their sensitive underground listening posts – before launching their dawn attack. Dark and dank tunnel under Vimy Ridge. Little remains of the infrastructure that once lined these tunnels, and they are mostly dank and lined with moss and green mold. Other than a few dilapidated beds and chairs, there is little evidence of human habitation. One would like to see more invested in restoring part of the tunnel network to its original condition, (along the lines of the Churchill War Rooms in London), but lack of funds, as well as the local weather and hydrology (flooding of the tunnels during stretches of wet weather is common) make that unlikely anytime soon. On a positive note, the federal government has recently announced plans to construct a permanent visitor centre at the site. Let’s hope some resources are devoted to upgrading the tunnel display as well. Prior to heading back to Arras, we made one final stop. A few minutes walk from the interpretive centre is Canadian Cemetery No. 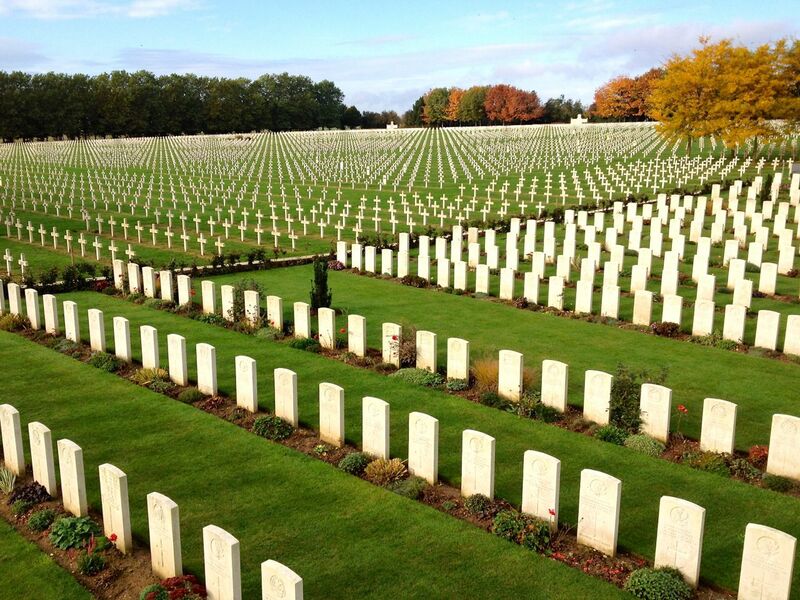 2, a peaceful site where almost 3,000 WWI dead, mostly British and Canadian, are buried. Further mute testimony to the devastation of war. Should you ever find yourself in Paris or northern France, I would highly recommend a visit to Vimy and the surrounding war cemeteries, regardless of your nationality. There are few places in the world where there is such a concentration of war graves, and the combined effect of both the scale and simple beauty of these sites provokes a complicated mixture of emotions, from horror, sadness and shame, to reverence, humility and peace. Perhaps, as Schweitzer said, soldiers’ graves do make the best preachers of peace … but only if someone is there to listen. So just go, if you have the chance.